more. In this tutorial we will learn how to utilize the power of the Cosmic JS CMS to easily display, track, and update large amounts of data. As there are many articles on this site to help you get started using Cosmic JS, this tutorial will assume you have a basic understanding of how Cosmic JS works. Refer to the Getting Started Guide. As Cosmic JS is an API-first CMS, it is exceptionally easy to get up and running - you just need to make a simple asynchronous call in Vue. Throughout the course of this tutorial, you will be able to see just how easy it is to divvy up data and update it using the Cosmic JS CMS. When creating a site for educational purposes, your site requires large amounts of text, images, videos and other assets to be hosted. As you continue to iterate on your site, it is vital to not only be able to edit those assets easily but to also be able to access them readily. First, we need to create a Bucket for our project. Once that is done, we can leverage some unique properties that Cosmic JS offers to compartmentalize our data. Because the site being built in this tutorial is centered around our Solar System, let's add a new Object Type called "Cosmic Assets". The Cosmic Assets Object will be responsible for containing information, images, and other assets about the inhabitants of our Solar System. For example, if I wanted to add some information about the planet Jupiter - I would go into the "Cosmic Assets" Object type, and create a new Cosmic Asset named "Jupiter". Now, we have a Cosmic Asset that can host any data we want to tie to the planet Jupiter. We can add images of Jupiter, give expositional data, and even list quick tidbits of information using the Text Input Metafield provided by the CMS. Being able to break up data of our Cosmic Assets into the content field, image Metafield and text input Metafield make it extremely easy to take a glance at the CMS and understand where each piece of data is being rendered in our Vue.js application. Because our solar system contains so many objects, we should leverage the v-for property that Vue offers us to loop through them. This prevents us from repeating our code for each celestial object, and allows us to utilize the full power of component based design. The first component, referred to in our project as Homescreen.vue, is responsible for rendering everything. It calls and obtains the data we added to the Cosmic JS CMS, and uses it to render our application. The second component, referred to in our project as CosmicAsset.vue, is a short introduction to the celestial object. It displays a small image, and the name of the celestial object. If this component is clicked, it renders the next component: CosmicPage.vue. CosmicPage.vue renders a full screen component, which gives detailed information about a specific entity. It features a big expositional paragraph, some fun facts, and other information such as size and it's distance from Earth. As you can see above, we find the Bucket we want, get our uploaded data from it, and mutate it how we want to. We filter the objects on the data and determine whether they are Cosmic Objects or simple content that is to be rendered on the page. As you can see, we take the specific celestial entity's information in the form of an object and filter through it to display what we want it to. 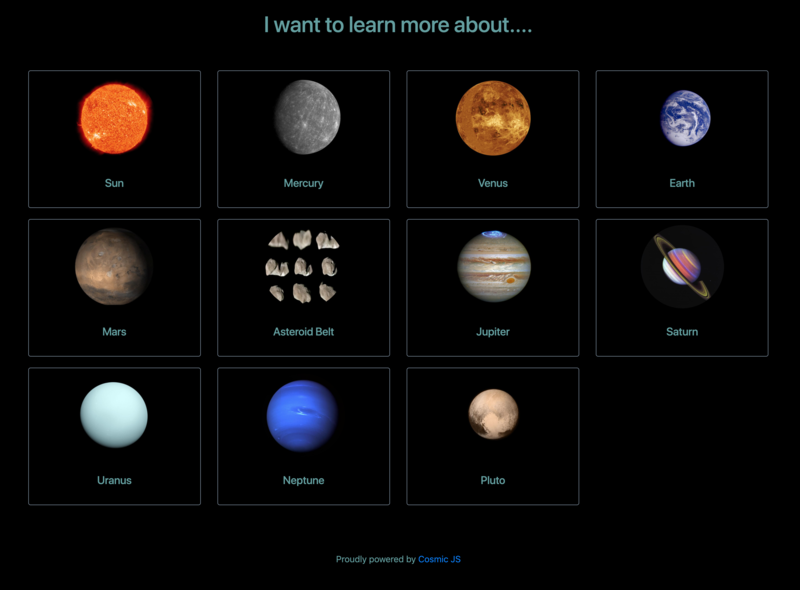 In this tutorial, we uploaded a large amount of data to Cosmic JS so that we could create an educational application that teaches about the things in our Solar System. By leveraging the Cosmic JS API, we could easily and seamlessly access that data. Cosmic JS is a lightweight platform with an extremely powerful CMS to offer. If you have any comments or questions about building apps with Cosmic JS, reach out to us on Twitter and join the conversation on Slack. When you're laser focused on writing songs, getting the most out of your studio time, and finding gigs, you can't be bothered with setting up a static site for your band or dealing with abstruse CMS systems.